When fall arrives, the holidays are just around the corner, which means that it’s time to gather at each other’s homes once again. If it’s your turn to have family over for the holidays, now is the time to have your bathrooms spruced up as your house guests are bound to notice. October is a great month for a bathroom remodel because you still have enough time for large-scale projects or for an update of countertop and cabinets. What your bathroom remodeling project will require depends on its size, your renovation needs, and personal taste. Customized Renovations: Do you need to replace any outdated or broken units in your bathroom, which include the sink, faucet, toilet, and beyond? All the replacements should have a sleek, modern, and functional design that fits your style. Installing a new glass tile vanity is one example of transforming an ordinary renovation into a personal work of art. Shower & Tub Replacements: If you have guests staying overnight, your showers need to be in top shape. If they are outdated or faulty, a full replacement can boost your bathroom’s value and appeal. Fresh Floors: Old, dated tile or damaged vinyl floors can negatively affect your bathroom’s look. Updating your floors with modern, functional materials that are both safe and waterproof will not only make your bathroom look great, but add to its value as well. There are many new, trendy looks to choose from. Revamped Walls: If your bathroom has an outmoded color scheme, redesigning the walls is the first step to updating your bathroom’s palette. You can also decorate your walls with tiles or fresh wallpaper to spruce up a bland design. Gorgeous Trim: Installing fresh crown molding or taller floor trim is the finishing touch that new walls and floors need. There are plenty of beautiful patterns and styles to choose from that can bring out your unique style. Novel Lighting: Illuminating your bathroom goes far beyond replacing light fixtures. It’s possible to knock out new windows and install solar tubes to let in natural light, crafting a bright and inspiring space. Innovative Storage: A bathroom filled with clutter isn’t an inviting place. However, installing modern storage solutions will expand your bathroom’s storage capabilities and maximize the use of every square foot of space. 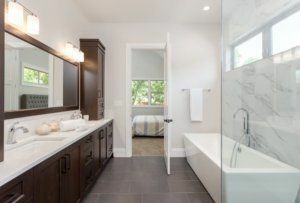 If you’re stuck with the thought, “I need to remodel my bathroom, but I have no idea what it needs,” you should work with a bathroom remodeler. Professionals at Republic West Remodeling know how to bring your dreams to life with a detailed design consultation, a full-color 3D rendering and detailed project plan. Getting your bathroom ready for guests is easy and stress-free with the help of Republic West Remodeling. Check out our prior projects here. A process you can depend on. A custom remodeling process that strives to deliver a caring and respectful experience with a successful outcome that you can be thrilled with. We work hard to give you certainty around the design & visualization, costs and time to complete the project. We are committed to giving you an experience you can trust and a remodeling outcome that you will love. Republic West Remodeling serves the Metro Phoenix and Scottsdale area, offering full-service bathroom remodels, kitchen remodels, full home remodels, room additions and more. Call us at (480) 428-2695 or contact us to schedule a complimentary consultation with one of our award-winning Designers.